You can find spas in strip malls, high-end resorts, and fitness centers. Some spas are simple facilities with not much more than a massage table, while others are luxurious destinations that draw travelers from around the world. Spas cater to a wide variety of clientele who are looking to unplug and find stress relief. Some premier health spas have designed multi-day wellness boot camps for executives with regimented diet plans, physical evaluations, and personalized treatments. Spas have also become a popular alternative for bachelorettes who want to relax and be pampered rather than go clubbing. Others seek out spas in order to attend retreats that focus on mindfulness, or to receive anti-aging skincare treatments. A spa provides a range of services for health management and body relaxation; these may include massages, body scrubs, steam baths, facials, waxing, and nail care. The word “spa” is often used to describe a resort located by mineral springs that are thought to have health-promoting properties, but the term is also associated with a wider array of commercial facilities offering wellness treatments. In 2015, there were 120,000 spas around the world that generated approximately $99 billion in revenue, according to First Research Inc. The United States is the largest spa market, with 21,000 facilities and $16 billion in revenue. However, the demand for spas is growing not only in the U.S. but around the world. 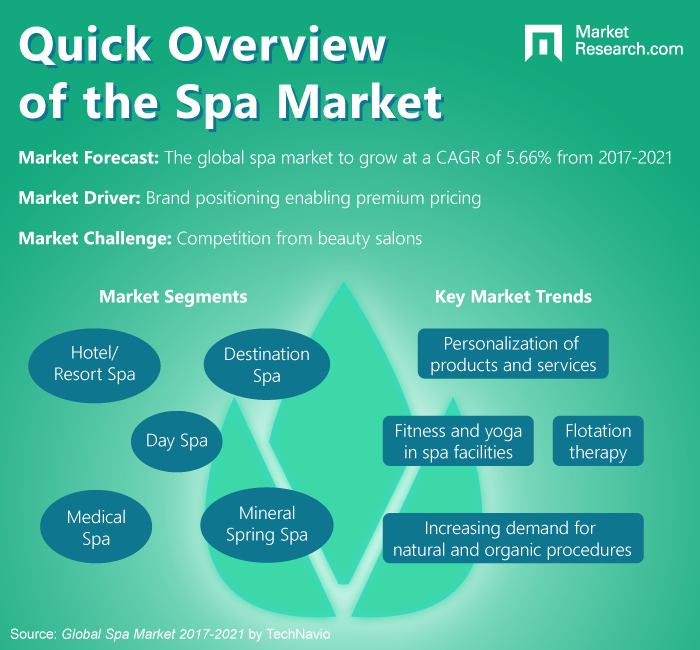 The global spa market is forecast to rise at a compound annual growth rate (CAGR) of 5.66% from 2017 to 2021, Technavio reports. The demand for spa services is connected to personal income, tourism, and other demographic trends, but the hectic pace of modern life may also increase the need for these wellness services, according to Beth McGroarty, Director of Research and PR at the Global Wellness Institute. “What’s driving this trend is today’s state of unprecedented stress: being connected 24/7, the lack of boundaries between work and life, and the fact that by 2030, 80% of the human population will live in urban, nature- deprived areas,” she said in an article published in DAYSPA. As McGroarty puts it, spas are “oases” where people can detach from the chaos of daily life, enjoy quiet time, connect to nature, and find a sense of balance. One notable spa industry trend is the personalization of products and services. Customers that are seeking a premium experience do not want cookie cutter treatments, but a more bespoke experience. In addition to personalized services, spas are also focusing on strengthening their brand positioning to support premium prices. Because the global spa industry is highly fragmented, marketing plays an essential role in differentiating one company from the next. Hot Springs Resort & Spa is located on 100 acres in North Carolina. Guests can take long hikes along the Appalachian Trail or enjoy scenic mineral baths. Lanserhof offers a blend of modern and holistic medicine, including detox treatments, Vital Aging, movement therapy, mental training, and beauty and skincare treatments. Marriott International, a worldwide hotel chain, provides luxury spa packages in a variety of destinations including Phuket Island, Maui Resort, Cancun, and Napa Valley. Massage Envy Franchising focuses on massages and facials. It has a network of 1.65 million members across 49 states and recently opened its first franchise in Australia. Rancho la Puerta is a fitness and spa retreat in the mountains of Baja, California, that offers exercise classes, holistic therapies, mindfulness classes, and farm-fresh meals. From bare bones facilities to luxe destinations, spas offer an antidote to the pressure of modern life and an avenue for preventive health, anti-aging, and wellness. As the middle class expands and urbanization increases, the demand for spas is expected to rise in emerging economies as well, providing new opportunities for expansion and growth.